Good looking dial, with subtle ingenuity with the subdial. 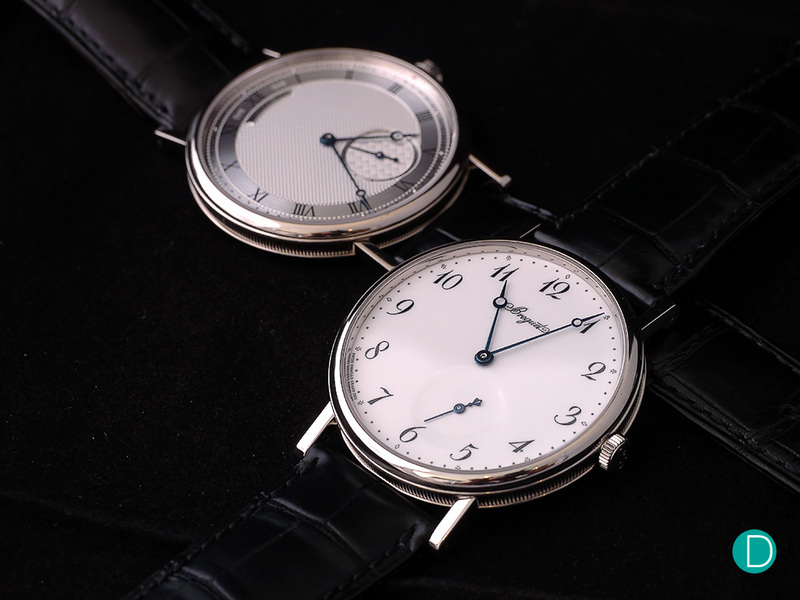 Extra thin movement with adequate finishing. 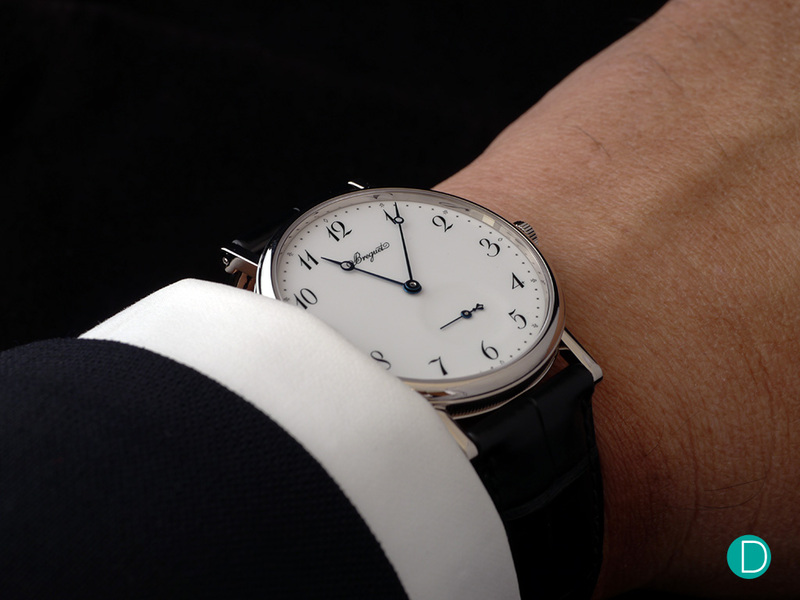 Breguet reveals its latest Classique rendition with the new Classique 7147 in enamel dial. 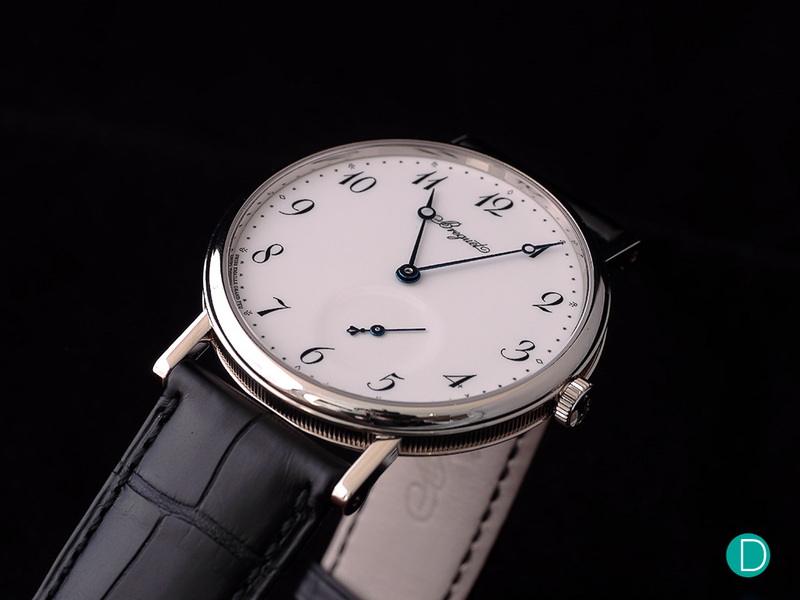 The dial is complete with Breguet numerals, hands and an iconic displaced seconds subdial. The Breguet Classique 7147 in grand feu enamel. The case is sized at 40 mm and is available in white gold and rose gold. 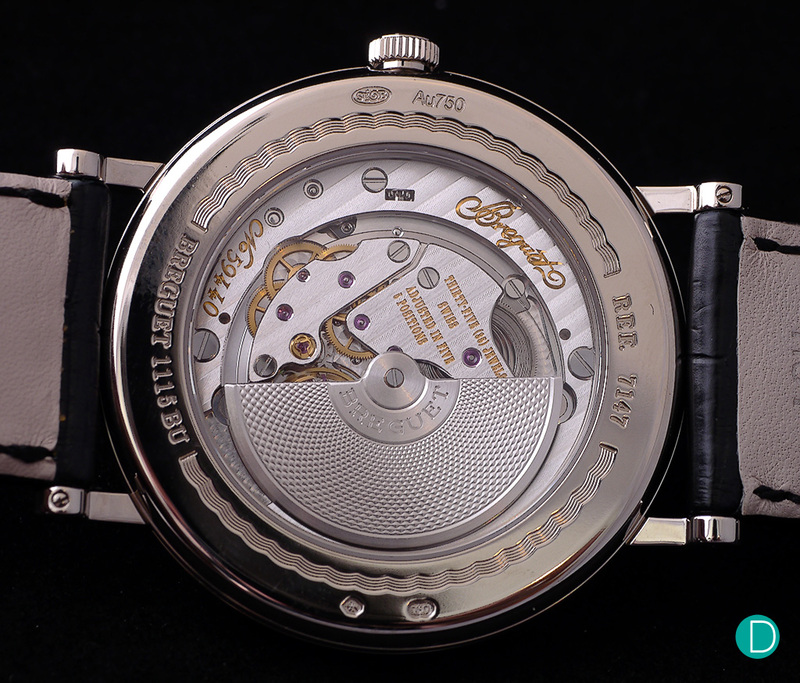 The thin profile is decorated with Breguet’s signature fluted caseband and welded lugs with screw bars. The simple case is fixed with sapphire crystal on the front and back. Available in white gold or rose gold case, the 40 mm sized watch is the archetype of a classic timepiece. 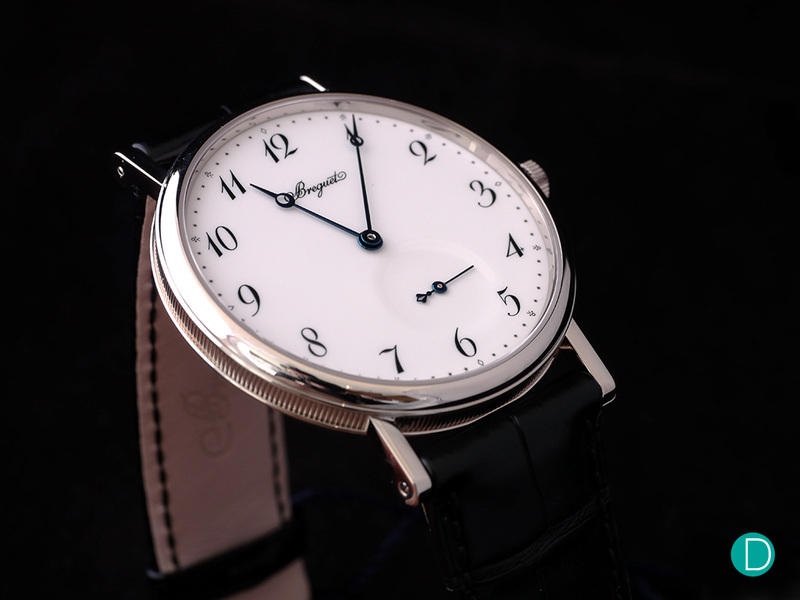 The new version is fit with a grand feu enamel dial with Breguet numerals, a different take on the previous renditions. Older versions used engine turning hobnail dials. To create the enamel dial, enamel powder is humidified to form a paste called barbotine. The latter is then applied in successive layers to a metal disc repeatedly fired in a kiln heated to more than 800°C. This process continues until the dial has attained a radiant whiteness. This latest 2017 Breguet Classique is arguably the best looking and most sensible enamel edition from the maison. Previous versions had controversial features like a date window next to the 3rd hour marker. 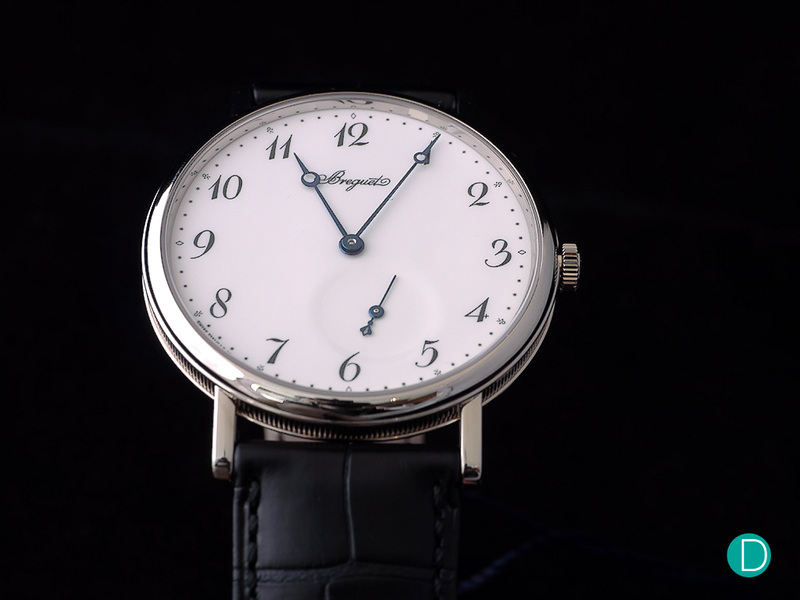 Instead of using a dual piece enamel, for a subdial, Breguet shows its dial making prowess by creating a single piece enamel with a sunken dimple at 5 o’clock. With this smooth transition on the dial surface, the subdial portion is only subtly visible from certain angles. The Classique 7147 utilises a unique asterisk minute track with diamond markers at 12, 3, 6, and 9 o’clock and fleur de lis-style markers on the other hours. The hours and minutes are aptly indicated by traditional blued steel Breguet hands while the seconds are indicated by a baton-style hand. The Breguet Classique uses the Caliber 502.3SD, a 12 lignes, 2.4mm-thick automatic movement, with up to 45 hours of power reserve. The Classique 7147 houses the self-winding Calibre 502.3SD, equipped with a silicon balance spring and an inverted in-line lever escapement with horns also made of silicon. The 35 jewel movement measures just 2.4 mm and has a power reserve of 45 hours. Appropriately decorated and finished at its pricepoint, the movement back reveals a fine barley corn on the off-centre winding rotor, Côtes de Genève on the bridges and on the baseplate. On the wrist, the sunken subdial appears to be on the same plane as the rest of the dial at certain angles. While many opine that a smaller sized case would be a better choice, I beg to differ. 40 mm is a good size in today’s context, and the watch as is, is as good as it gets. The Classique 7147 is available in rose gold and white gold and comes with matching alligator leather straps and gold pin buckles. The prices for the rose gold and white gold variants are USD21,500 and USD21,000, respectively.